What are Tastykakes? They are the Philadelphia variant of Little Debbies, Ding Dongs, Twinkies — little snack cakes with icing in a plastic wrapper. Definitely not health food. But folks in the Philly area have been enjoying them since 1914. To get this exotic treat in Charlotte, visit Philly Connection in Matthews. It’s on Highway 51 at Independence Boulevard, sharing a parking lot with a Home Depot. Owner Matt and helper Rigo work the grill, making Philadelphia’s signature sandwich, the Philly cheesesteak. The customer mix reflects today’s diverse New South. Philadelphians who’ve moved to the Queen City. Southerners discovering this fabled food. Latino work crews who appreciate the hearty sandwiches. 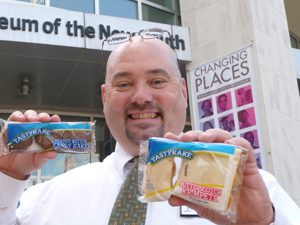 “Everything comes straight from Philadelphia — the sandwich stuff, the Tastykakes — shipped in by the Philly Connection franchise,” says Matt. Philly Connection – No longer in business.